RedCo Audio saved my studio, my sanity, and my bank account. 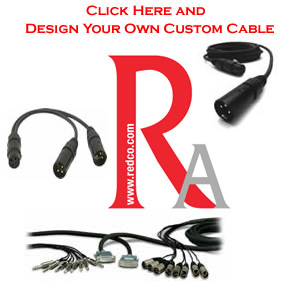 If you are wiring a studio, a patch bay, a home theatre, or any other kind of DIY multimedia project you should buy your cables exclusively from RedCo. Is that a ringing enough endorsement? Let’s backtrack for a second. In every occupation, hobby, or pastime there are hidden costs that do not reveal themselves until you are in too deep to avoid them. Well, maybe not entirely hidden, but at least not obvious. When you buy a new photo printer, you know it will need paper and ink, but you aren’t always thinking about how expensive those glossy papers and photo inks will be, and how you might need a new card reader for all your massive files. The same goes for any musical hobby. You assume your big expenditures will be your instrument, amplification, and various tone devices – and wow that is already a lot to expend, let me tell you. Instead of equipping myself to play bass from scratch in the last 12 months I could have put a down payment on a brand new car or a timeshare. Eventually you get there. I did, and I am historically terrified of electric rock signal chain technology. I’d prefer something lower-fi, like a stick tied to a washtub. But I persevered – I got my ideal instrument and signal chain set up in my custom home studio, only to realize I didn’t have enough cables, and when I looked them up online I found that a 2ft patch cable costs THIRTY DOLLARS. This actually looks pretty elegant, as washtub basses go. …all the blood rushed from my face. I almost fell out of my chair. I was going to have to drain my entire savings account to cable my studio. Not only that, but the cables weren’t even what I needed! In one case I needed a 35ft, not 50ft, and right angle TS connector, not straight TRS – but that didn’t exist. I’d be spending a mint on the wrong options! Enter RedCo Audio. They are a small company in Connecticut specializing in hand-made custom cables. And, not just custom lengths. You can pick everything from the gauge of the cable down to the angle of the connection. They can make audio cables, coax connections, and custom multi-channel snakes. They have every option you could every imagine, including the very same materials used by Mogami and other boutique brands. A $300 spend at RedCo got me a dozen new cables totaling over 250 feet, which would have cost more than $1000 to buy retail. I’ll admit, it was super-confusing to pick all the right cables and connectors, but I left notes in each order about what I planned to use the cable for and RedCo gave me an unexpected personal call to recommend a few changes in my order, which they made for no additional cost. Two weeks later, I had a box of brand new custom cables on my doorstep, each the perfect solution to a need in my home studio. I love RedCo Audio. Love love love. I will never in my life buy studio cable anywhere else, and I’ll always get exactly what I need.